Alfa Romeo reveals are few and far between, so it goes without saying we are pretty excited about the Tonale. Even though it’s a concept for the time being, it signals the brand’s intention to diversify its portfolio by adding a smaller crossover to slot below the Stelvio. After all, the Italian brand announced the CUV way back in June 2018 and is now finally giving us a taste of what’s to come. Even though it’s a window into Alfa Romeo’s future, the Tonale has retro design cues paying tribute to the marque’s beautiful cars of yesteryear. For example, the 21-inch wheels are reminiscent of an old-school telephone’s disc and remind us of the mid-engined 33 Stradale from the late 1960s. Up front, the headlight arrangement is a nod to cars such as the SZ and Brera, but with a modern twist as it would be fitting for a crossover for the next decade. Alfa Romeo mentions the side profile has hints of the Duetto and Disco Volante Spider, while the back of the concept with its wraparound glass, roof spoiler, sleek full-width taillights give the Tonale an interesting look which hopefully be carried over on the production model with minimal changes. Inside, the dashboard is home to a pair of digital screens, with a 12.3-inch diagonal for the instrument cluster and a 10.25-inch touchscreen for the infotainment system. The climate vents come with built-in screens and there’s some nifty LED ambient lighting creating a cozy atmosphere. Fingers crossed Alfa Romeo won’t tone it down too much on its way to the production line. Technical specs are shrouded in mystery at this point, but Alfa Romeo does say the Tonale has been envisioned with a plug-in hybrid powertrain. A total of six PHEVs will be launched by the brand by the end of 2022, and the Tonale will certainly be one of them. The Tonale concept will be on display at the 2019 Geneva Motor Show along two other debuts from the brand, the Giulia Quadrifoglio and Stelvio Quadrifoglio in the new Alfa Romeo Racing Edition specification. 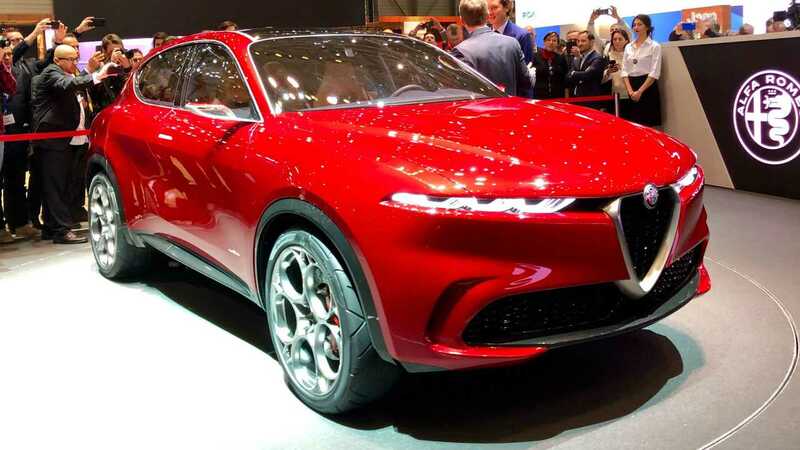 5 Comments on "Alfa Romeo Tonale Previews Plug-In Hybrid Compact Crossover"
Nice, love the looks of the Alfas and the Stelvio was incredibly comfortable for me. Nice that they actually fit comfortably. My next car will be a BEV, but I could probably talk my coworkers into a PHEV who aren’t ready for a BEV yet. sorry for you, in most part of Europe we don’t have chargers infrastructure to sustain BEVs, so PHEV are a smart choice. Man, Alfa makes such a beautiful car. I usually hate crossovers, but this is beautiful. I had a 67 Alfa spider and it’s still the most beautiful car I have (or will ever) own.